The UTG Defender Handheld Tactical flashlight is a particularly favored accessory for weapons enthusiasts. 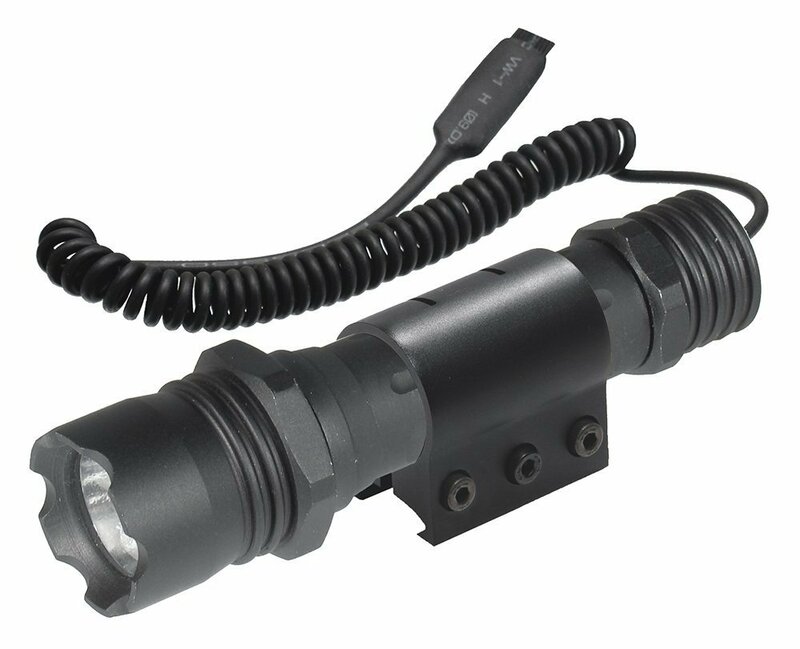 Its Xenon bulb emits a bright 126 lumen beam which can be switched between a flicker mode or permanent power on – all via a toggle switch accessible even if mounted on a weapon. This flashlight has user reviews that report some issues with units (so it could be a matter of abuse or careless use) and the remote switch when mounting the torch on specific weapons. Aside from this, the flashlight gets a good 4.2 / 5.0 rating and is a good buy. The UTG Defender Handheld Tactical flashlight is a weapons-mounted light that uses the Xenon bulb. Its lumens output is 126 and one of its main features is the push button quick switch and a permanent twist-on switch. This means you can have a flicker mode with the quick switch which an also serve as a signal to someone from afar. It is currently selling online which has a lesser cost compare to the listed retail price. Leapers is the company behind the UTG Defender and has its offices in Michigan. They have been in the business of selling outdoor equipment and supplies since 1991. In 2009, they started a campaign to manufacture and sell products Made in the USA and this is the UTG Pro brand. Other features of this model is a remote pressure switch, a tactical flashlight ring, mounting on a Picatinny/Weaver rail, a length of 5.22 inches which works beautifully for hand-held applications as well, and 2 lithium batteries. According to existing customer reviews, the flashlight is well made although some care should be taken when using it. It cannot be tossed aside or dropped without incurring damages. It is also not the best for outdoor use because it has a lumen maximum output of 126. However, if the torch is used indoors, the beam can be blinding. This flashlight requires two batteries (type 123) which can be found in your local Target or Walmart. As mentioned at the start of this review, one of the main reported problems is the remote switch and the mounting. The switch appears to need careful rather than heavy-handed use whilst the mounting, on the other hand, tends to be too long and not tight enough especially for shotguns. You might have to buy a new mounting. For light recoil or AR platform weapons, this flashlight is perfect. It’s worth noting that the bulb (which produces such as bright beam) is xenon rather than LED. Xenon bulbs are used in modern car headlights and produce very bright and white light – but do use more power than an LED. This means that this unit will use up the batteries, and can run hotter, has a poorer output, is less durable, and takes more time to switch on and off. Nonetheless, for the money you are paying, it is an amazing deal. It’s as bright as a D-Cell and the finish is excellent. It’s not the perfect flashlight for all tactical weapons but it is ideal for the right weapon. You just have to make sure to match it properly. If you need a tactical flashlight and do not want to spend a lot of money, this is the one to buy. You can even buy several of them and still spend less than the high end tactical flashlights in the market. For flashlights you want to mount on your weapons or use for emergencies, the UTG Defender Series Handheld Tactical flashlight is a good buy. It has a push button switch that also doubles up as a remote pressure switch with tripe functions. It is powered by 2 lithium batteries and uses the 26 mm Xenon IRB bulb. The product is manufactured in China and sold in the U.S. Out of more than 450 comments from current users and previous buyers, this flashlight earns 4.2/5 star ratings.